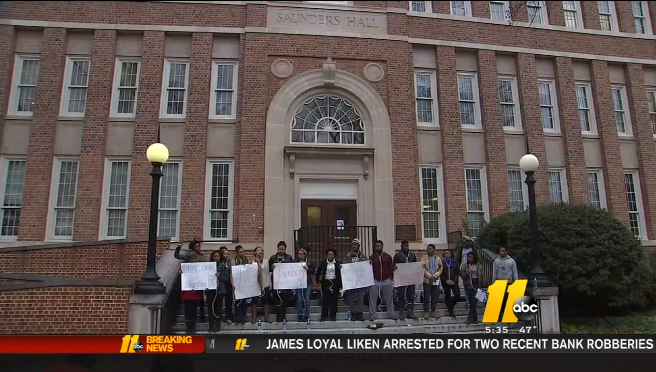 University of North Carolina, KKK building: Renaming passes, but some trustees vote against. A student protest outside the erstwhile Saunders Hall in February 2015. In 1920, University trustees named Saunders Hall to recognize William L. Saunders, an alumnus and trustee from 1874 to 1891. They cited his service as North Carolina’s Secretary of State from 1879 to 1891, his record as a compiler and editor of the Colonial records that became the foundation of the current State Archives of North Carolina, and his leadership of the Ku Klux Klan (KKK). “Many of us were more conflicted toward the end of this process than where we were when we began,” Cochrane said, adding that he voted “no” because of a sense of history and the different constituents the board serves. The UNC trustees did vote unanimously to place a marker near Saunders/Carolina Hall explaining its history and to create an educational program (of a format yet to be determined) that addresses race-related aspects of the school’s history.